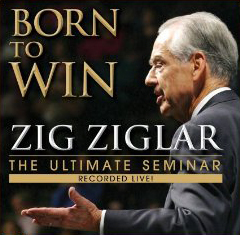 Affected at a very early age by the death of his father, Zig Ziglar learned firsthand the importance of self-reliance and a balanced work ethic. This foundation would eventually become his motto of: "You can have everything in life you want if you will just help enough other people get what they want." Zig was happily “over-married” to his wife of 65 years, Jean, whom he lovingly called “Sugar Baby.” He was a committed family man, a dedicated patriot, and an active church member. He was chosen by the Mississippi Broadcasting Association as “Mississippian of the Year” in 1985 and as “Communicator of the Year” by the Sales and Marketing Executives International in 1991. In April of 1995 he received his Honorary Doctor of Humanities from Oklahoma Christian University of Science and Arts, and was named an Ambassador of Free Enterprise by Sales & Marketing Executives International Academy of Achievement. He was recognized as one of the Toastmasters International Five Outstanding Speakers of 1997 for Contributions to the Art of Public Speaking and in 1998 he received the Sales and Marketing Executives Leadership Award and an Honorary Doctor of Letters Degree for Contribution to Literature on Human Potential from Southern Nazarene University. In August 1999 he received the National Speakers Association Master of Influence Award and the Toastmasters International Golden Gavel Award. In 2001 he was selected to receive the Cavett Award, the National Speakers Association’s most cherished award, presented annually to the member whose accomplishments over the years have reflected outstanding credit, respect, honor and admiration in the Association and speaking profession.